Grandmaster Richard Chun and Master Doug Cook have actively worked to promote the art of traditional taekwondo; one for over fifty years, while the other, half that, but with equal fervor. As the national Korean martial art increasingly becomes focused on the pursuit of Olympic gold, this legendary master and his senior disciple steadfastly support a vast mosaic that features not only sparring, but basic skills, poomsae, self-defense and a path to excellence in their teaching methodologies. It is an honor to have Grandmaster Chun as he seldom grants interviews. But in order to have a better understanding, it is important to know a little about these two martial arts greats. Who is Grandmaster Richard Chun? 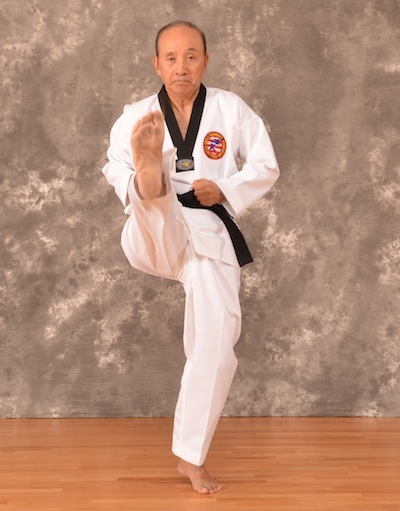 Grandmaster Richard Chun, 9th dan black belt, began his formal martial arts education under the direction of Ki Whang Kim and Chong Soo Hong, at the famed Moo Duk Kwan or "Institute of Martial Virtue" in Seoul, South Korea. By age fourteen, he received his first dan black belt. Following the outbreak of the Korean War, his family moved to Cheju Island where he attended high school. In 1954, at age nineteen, he returned to Seoul. Once there, he enrolled in Yonsei University and graduated in 1957. While at university, he served as captain of the taekwondo club and participated in several competitions. Entering the United States in 1962 as a student, he lived in Washington, D.C. and began studying for his master's degree in business and marketing at George Washington University. In 1963, with the assistance of past-president, Dr. Un Yong Kim, World Taekwondo Federation, (WTF) he officially established the Richard Chun Taekwondo Center, a school that has cultivated champions such as Joe Hayes and catered to movie stars and sports figures including Ralph Macchio (The Karate Kid), and dancer/actor Gregory Hines. During the same time period, with the help and support of General James Van Fleet, he created and organized the first Annual Universal Taekwondo Open Championships. He earned his master's degree at Long Island University and eventually went on to obtain a doctorate, becoming a professor of health and physical education at Hunter College in New York City. (USTA) in 1980, an organization whose mission it is to promote the ancient and evolving art of taekwondo, and currently serves as its executive director. He played a major role in organizing taekwondo as an event in the Olympics and has served as a senior international referee at international championships and Olympic competitions. For his many achievements in promoting taekwondo within the borders of the United States, he received the Presidential Award from the president of South Korea. In 1986, shortly before the Seoul Olympic Games, he was named special assistant to the president of the WTF. He has also received many citations over the years from the Moo Duk Kwan, the Kukkiwon and the WTF. Grandmaster Chun continues to share his knowledge of taekwondo through the written word with five best-selling books to his credit, all of which have been translated into several foreign languages. Dr. Chun has also produced a number of instructional DVDs on self-defense, sparring and forms, available through the USTA website and YMAA Publication Center. Master Doug Cook, 6th dan black belt and a senior student of Grandmaster Chun, is certified as an instructor and in rank by the USTA and the Kukkiwon. He is a six-time gold medalist having frequently participated in the New York State Championships and the New York State Governor's Cup Competitions. He has trained in South Korea on multiple occasions and currently oversees popular training and cultural tours to the homeland of taekwondo. He holds a D3 status as a U.S. Referee and has received high honors in the form of a "Letter of Appreciation" signed by WTF past-president, Dr. Un Yong Kim. In 2003, Master Cook was awarded the "Medal of Special Recognition" from the Moo Duk Kwan in Seoul, South Korea. In 2004, while attending a training camp in Korea, he received a special citation from the Korean government for forging a stronger relationship between South Korea and the United States through the martial arts. In June 2006, he was inducted into the Budo International Martial Arts Hall of Fame as "Taekwondo Master of the Year." Recently he was listed in a major martial arts magazine as one of the "Top Twenty Masters of the Korean Martial Arts in America." In 2009 he was invited to speak at the prestigious Korea Society in New York City. Master Cook appeared on the cover of issue 32 of Totally TaeKwonDo magazine, and was inducted into the TaeKwonDo Times 2011 Hall of Fame as "Writer of the Year." In December of 2011, Master Cook received a special citation from the Ambassador of South Korea at the nation's embassy in Washington, D.C. Most recently, he was inducted into the Legends of the Martial Arts Hall of Fame as "2013 Taekwondo Master of the Year." Master Cook has provided training for the U.S. Army National Guard/42nd Division, Homeland Security, and several police and sheriff's departments. Master Cook was called upon to demonstrate taekwondo as part of a three-man team at the annual Oriental World of Self-Defense held in Madison Square Garden, New York City. Question: A question for you both: How old were you when you started martial arts training and why did you start? Grandmaster Richard Chun (GMRC): I began studying at the age of eleven. I was very fortunate to train at the Moo Duk Kwan, one of the best schools in Seoul at the time. When I look back, I realize that my original motivation for training was questionable. At the time, I was a daejang or leader of a gang. My authority was challenged one day by a boy who was training as a boxer. I was determined to maintain my position within the group and began studying what was then tangsoodo, so that I would win against my rival. When the time came, he refused to fight saying that he did not want the leadership position in the first place. I was embarrassed by my anger and we became friends. That was a good lesson for me. It taught me humility; an essential virtue of the martial artist that I continue to cultivate to this day. Master Doug Cook (MDC): Unlike Grandmaster Chun and the great majority of my colleagues who began their journey through the martial arts during their adolescence, I started taekwondo training in my late thirties. The I Ching, or Book of Changes, an ancient Taoist classic, states that "everything happens in its appointed time" and I couldn't agree more. From my first day in the dojang I knew instantly that the time was right. I was looking to build physical fitness and a quiet confidence while engaging in a discipline emphasizing Asian philosophical thought. The more I practiced, the more I knew the art was right for me until, following years of training, I devoted my entire life to practicing, teaching and writing about taekwondo. What was your first martial art? GMRC: When I began training, taekwondo did not yet formally exist. As I mentioned, I studied tangsoodo, which eventually evolved into taekwondo. Today, tangsoodo still exists but taekwondo has grown into an Olympic sport and the most popular martial art in the world today. MDC: I have only practiced taekwondo and for me, it is more than enough. Taekwondo provides everything I need physically, intellectually and spiritually. Even though it is not defined as such, it is my religion. I will always remain faithful to this art. Grandmaster Chun, how did the practice of taekwondo differ in Korea at the Moo Duk Kwan during the 1950s and 60s? GMRC: Everyday at the Moo Duk Kwan began with the students mopping the floor. I would always arrive early so I could complete the chore quickly. Master Chong Soo Hong was very strict and the instructors demanded unquestionable discipline. When it came to learning a technique, there was no verbal explanation; you were forbidden to ask questions. The teacher would demonstrate, we would copy and then practice the skill 200 to 300 times a day. We were required to understand the meaning of every technique before moving on to the next. It was a very exciting time for me. I remember being asked to demonstrate the turning hook kick. I had practiced long and hard and did well. We sparred vigorously and practiced poomsae (forms) then known as hyung. Now, things are different. The student is permitted to ask questions and the teacher makes corrections. In the 1950s and 60s we did not do that. Testing was similar to today but expectations were higher. If you made one or two mistakes, you failed. You were not allowed to try again. Low belt holders did three-step sparring and did not do breaking while high ranking students performed il su sik (one-step sparring), ho sin sool (self-defense), kyorugi (free-sparring) and kyuk pa (breaking). Forms, however, were the most important element. When and where did you open your respective schools? GMRC: Originally, I taught at Sigward's Sports Academy in New York. Then, in 1963, I opened my school, the Richard Chun Taekwondo Center, on 77th Street and 1st Avenue in Manhattan with the assistance of past-WTF president and IOC member, Dr. Un Yong Kim. During the same time period, with the help and support of General James Van Fleet, I created and organized the first Annual Universal Taekwondo Open Championships. Establishing a martial arts school and recruiting new students then was not easy. However, an interesting turn of events brought me fifteen new students quickly. One evening, while I was enjoying a cocktail in a Greenwich Village tavern with a friend, six ruffians approached us asking for money. The group left after I gave them three dollars, but quickly returned to demand more. I told them I had no more money, but the situation turned violent. Acting in self-defense, I rendered two of the thugs unconscious while the remaining four ran. A New York Post reporter coincidently passing by took notice of the commotion and wrote a short article for the paper the following day. After the article appeared, people started calling and my school began to grow. After many years, I eventually moved to a larger facility on 86th Street between 2nd and 3rd Avenue in New York City. MDC: In doing research for my first book, the term "Chosun" continuously surfaced throughout Korean history; first as Ko-Chosun in ancient times, and then again when referring to the Yi or Chosun Dynasty. Literally translated, it means "land of the morning calm." Flying at thirty-thousand feet, about to make our final descent into Kimpo International Airport during one of my initial training tours to Korea, I saw the peninsula shrouded in mist. In that moment, the political turmoil that existed below evaporated and all truly appeared calm. I knew then, if and when I established a school, it would be called "Chosun." The school, Chosun Taekwondo Academy is located in Warwick, New York. Grandmaster Chun, is teaching in America different from teaching in South Korea and if so, how? GMRC: Things are different now in Korea then they were when I taught there. I followed the example of my master, teaching techniques by example and without explanation. If the student made an error, we would not correct them immediately, but would let them learn the right way on their own. To the modern mind, this may seem counterproductive but then, it worked well. When I opened my own school, I began teaching the same way, showing the students the motions – kicking, blocking striking, patterns – letting them follow, but felt very awkward receiving their questions. I followed this method for about seven years then modernized my teaching to fit the customs in America. If I did not answer questions, students would be dissatisfied and leave the school, so I began explaining the techniques over and over again. I discovered that once they understood the reasons and purpose of the motions, they began training much harder. As time went by, reflections of training in Korea began to appear. My students learned not to complain when they made contact during sparring. They no longer protested when they experienced minor injury. They grew very strong and resilient.